The National Marine Fisheries Service and Bonneville Power Administration treat Snake River salmon and steelhead as if the populations originated in the 1990s, when ESA listing occurred. Hence, a BPA release (Citizen's Guide to the 2013 Comprehensive Evaluation) stated "Most ESA-listed wild fish populations that spawn in the basin have increased in abundance since their listing in the 1990s." The NMFS most-recent Biological Opinion tells us that most wild listed salmon in the Snake River are "trending upward" since the 1990s. I look at trends in a broader time frame. The most unbiased assessment of the status of wild spring/summer Chinook salmon in the Snake basin derives from spawning nest (redd) counts by the Idaho Department of Fish and Game in late summer each year after 1956. The Department counted redds in the same index areas of the Middle Fork Salmon River Unit from 1957 to the present. The Unit includes Middle Fork tributaries, the Middle Fork main stem, and Chamberlain Creek, all wild production areas. The median count of redds in 1957-1961, before the four lower Snake River dams affected runs, was 2400. In the most recent five years, the median count in the same spawning areas was 840, a reduction of 65%. The two-thirds reduction in redd counts in the Middle Fork Salmon Unit depicts only part of the population decline there over the half-century of record. In 1957-1961, gill nets in the Columbia River harvested about half of all spring Chinook that entered the Columbia River. In recent years the harvest of spring Chinook, mostly by Indian fisheries, has amounted to less than 10%. Adjusting for this half-century drop in harvest, I estimate that wild spring Chinook salmon in the Middle Fork Unit have suffered a decline in abundance of approximately 80% rather than 65%. I reject the NMFS/BPA self-serving use of the 1990s base level of wild spring Chinook abundance as the agencies attempt to depict population trends for ESA-listed spring Chinook as "increasing." Steelhead spawn in spring, when flows and turbidity make redds inconsistently visible. However, the dam counts of wild B-run steelhead recently do not support optimism about run status. Wild B-run fish are in trouble. The foregoing observations do not begin to address the longer-term losses of Snake River salmon and steelhead. Only about 2% of pre-development wild fish numbers remain in the basin. Mortality does not end when juvenile spring Chinook salmon reach the tailrace of Bonneville Dam. Aggregations of predaceous birds in parts of the Columbia River estuary, a response to the millions of hatchery fish released in the Columbia River system, contributed to the long-term decline in Snake River wild Chinook. 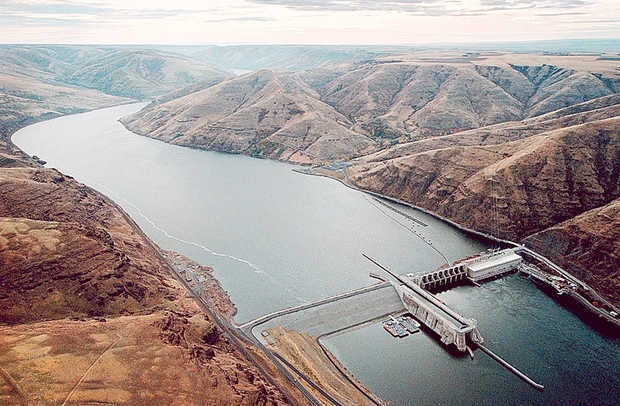 In a recent research paper in the Canadian Journal of Fisheries and Aquatic Sciences, authors H. Schaller, C. Petrosky, and E.Tinus concluded that 76% of juvenile salmon that pass through the Columbia River hydropower system die after reaching the estuary as a result of injury or stress incurred while migrating. As the Columbia River basin continues to warm over the coming decades, fewer ESA-listed wild spring Chinook and steelhead juveniles will leave natal streams to migrate seaward. Yet the new NMFS Biological Opinion fails to anticipate a need for main-stem river management that would substantially reduce passage mortality. It ignores studies of removal of the lower Snake Dams or increased spill, and relies on the wobbly crutch of habitat improvement. But habitat improvement has no utility for listed spring Chinook in tributaries that lie in wilderness or primitive areas. I conclude that the "new" Biological Opinion egregiously fails wild spring Chinook recovery. The old "new" Biological Opinion is not enough, and deserves the legal attack that will come.